When it snows in the DFW metroplex, everything basically shuts down because we don’t get light, powdery, fluffy snow. No, in North Texas, we get icy snow that turns even icier on the roads. Luckily, my friend, Amanda, and I had already planned to take the day off to visit a museum. By the time we got going, the snow had stopped, the roads had dried up, and everyone had made their two-hour commutes to work. I met her at her place and we celebrated by making snowballs in her apartment parking lot and throwing them at the outside wall of her apartment building. We weren’t worried about disturbing anyone because the only thing more pitiful than our snowballs were our throwing abilities. We set off for lunch at Legal Grounds, a local cafe started by a lawyer that, as Amanda says, “needed the money.” On the way there, we passed an old Jeep Cherokee and started talking about how we always liked Jeeps when we were growing up, but we don’t really like them now because they look like every other SUV and not like Jeeps at all. At Legal Grounds, we drank our coffee, ate our Prom Cakes (banana oatmeal pancakes topped with fresh vanilla granola and caramel apple syrup), and started talking about the art in the place, which had changed since we were last there in fall. One of the paintings was of a lion, which made me think of how majestic, beautiful, and damnhellass scary lions are. That made me wonder how I would react if a lion attacked me, which made me think about how I don’t like guns, which made me think about how Amanda and I have been saying for years that gang fights in the 80s were cooler than gang fights nowadays because knives are cooler than guns. Our motto is, “Bring Back Stabbing.” So I told Amanda that I wanted to get a tattoo of a lion with a tattoo of a knife on my fist. 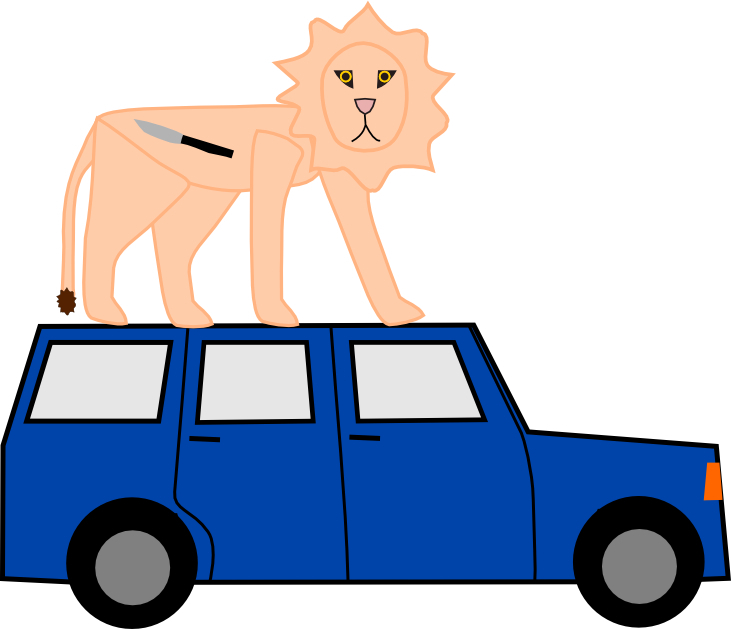 She said we should get a Jeep Cherokee from the 80s and put a picture of a lion with a tattoo of a knife on it on the Jeep so that nobody would try to steal it. From there, we went to the Perot Museum, which was even cooler than I thought it would be, even though the space exhibit was a bit blah. We also ran into Gabriel there! I hadn’t seen him in over a year, so that was exciting. Afterwards, we went across the street to eat at El Fenix. Theoretically, this should have been easy, but every time I told Amanda, “I think you turn left here,” she’d turn right, and vice versa. So it took awhile to get there, but it was funny giving directions to her on Opposite Day. Part of my belated Christmas gift to Amanda (thanks to Groupon) was taking her to see The Hobbit at the Studio Movie Grill. We had time to kill between dinner and the movie, so we decided to make a Starbucks stop because Amanda had been craving it for a week. I thought there was a Starbucks closer than the one we were heading to, but I couldn’t remember where it was. While we were driving, I saw it and pointed it out, so Amanda turned into the parking lot, parked right in front of it, and said, “I don’t see it.” We laughed. I thought she was joking, but then she asked, “Why did you tell me to go to the bird store?” At this point, I realized that while I was looking at Starbucks, she was looking at the bird store beside it. I pointed out Starbucks to her and we laughed, and then we sat in the car with the headlights on and the engine running for another minute. I asked, “Are we gonna do this or what?” We laughed again and finally made our way towards coffee. Afterwards, we made a couple of quick stops at a nearby shopping center to look for clearance coats, but we didn’t have any luck. How can you charge over $200 for a coat that was made in China? Has the cost of child labor gone up? What are your overheads? We gave up and headed for the movies. This specific theater used to be a different movie theater, but has been completely redone. It now has crazy young people music with lots of computer-based instruments, giant couches and chairs that are hard to get out of once you sit down, and a huge bar stocked with booze. There are flat screen TVs all over the place (anyone else think TVs in a movie theater is strange?) advertising specials or playing sports shows of some sort. Studio Movie Grill theaters are normally just a bunch of chairs with a bunch of tables, but this one had stadium seating, which is great for moviegoers who don’t want to watch the waitstaff run back and forth all night. I still don’t understand how the waitstaff carries all that food up and down stairs all day and night , but by golly, they do. We had already eaten, so we didn’t get 2nd dinner, but we did get sodas as part of the Groupon deal. I also ordered cookies because it was Snow Day dammit and we were watching The Hobbit dammit so I wanted to be a 12-year-old fatass and eat cookies and drink soda while I watched my movie. The movie was good, and I didn’t get a headache until about two hours in, so that was nice. After the movie, we headed to our separate abodes, filled with the sense of exhaustion that comes with Snow Days when you’re not 12. Amanda and I have had many exciting Snow Days over the year, but this is going to be one of the few that I actually remember because I doubled up on ginkgo biloba that day.